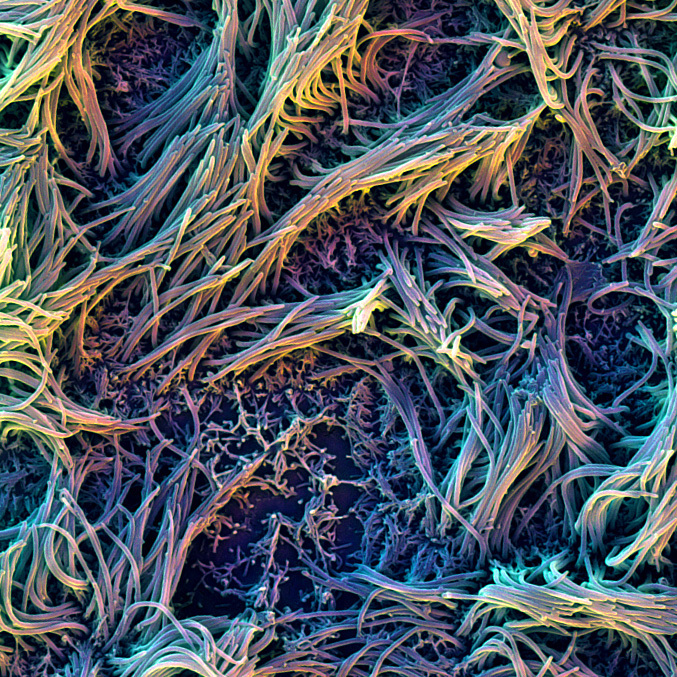 A research team at the Harvard John A. Paulson School of Engineering and Applied Sciences (SEAS) and the Wyss Institute for Biologically Inspired Engineering at Harvard University leveraged its organ-on-a-chip technology to develop a model of the human small airway in which lung inflammatory diseases, such as chronic obstructive pulmonary disease (COPD), the third leading cause of mortality worldwide, and asthma can be studied outside the human body. As reported in Nature Methods, the platform allows researchers to gain new insights into the disease mechanisms, identify novel biomarkers and test new drug candidates. COPD and asthma are inflammatory reactions in the lung which can be dramatically exacerbated by viral and bacterial infections, as well as smoking. It is known that many of the associated disease processes occur in the conducting airway sections of the lung that shuttle air to and from the alveoli or air sacs. However, much less is known about how inflammation induces distinct pathological processes such as the recruitment of circulating white blood cells and the buildup of mucus, which compromise the lungs of these patients, or how clinical exacerbations are triggered. “Inspired by our past work using the organ-on-a-chip approach to model the lung alveolus, we created a new microfluidic model of the lung small airway that recapitulates critical features of asthma and COPD with unprecedented fidelity and detail. Now with this microengineered human lung small airway, we can study lung inflammatory diseases over several weeks in chips lined by cells from both normal donors and diseased patients to gain better insight into disease mechanisms, as well as screen for new therapeutics,” said Donald Ingber, the senior author on this work who is leading a multidisciplinary team of scientists that has been at the forefront of organ-on-chip technology. He is also the Wyss Institute’s Founding Director, the Judah Folkman Professor of Vascular Biology at Harvard Medical School and Boston Children's Hospital, and Professor of Bioengineering at SEAS. Demand for such opportunities is especially high since small airway inflammation cannot be adequately studied in human patients or animal models and, to date, there are no effective therapies that can stop or reverse the complex and widespread inflammation-driven processes. “To closely mimic the complex 3D cellular architecture of actual human small airways, we designed a microfluidic device that contains a fully matured human small airway epithelium with different specialized cell types exposed to air in one of its two parallel microchannels. The second channel is lined by a human vascular endothelium in which we flow medium containing white blood cells and nutrients so that the living microsystem can be maintained over weeks. We then modeled inflammatory asthma and COPD conditions by adding an asthma-inducing immune factor or by setting up the system with lung epithelial cells obtained from patients with COPD,” said Remi Villenave, a former postdoctoral fellow in Ingber’s group and the co-first author on the publication. In both cases, the team was not only able to observe highly disease-and cell type-specific changes but could also exacerbate them with agents simulating viral or bacterial infection. “This new organ-on-a-chip technology gives us a window on molecular-scale activities in the context of living human lung tissue. It also provides us with a handle to dissect contributions of specific cell types and biochemical factors to small airway diseases, including how circulating immune cells are recruited to inflammation sites and how compromised cilia function contributes to abnormal mucus clearance in the lungs of diseased patients,” said Kambez Hajipouran Benam, who also is a postdoctoral fellow working with Ingber and the other co-first author of the study. Finally, the team provided proof-of-principle that the synthetic small airway-on-a-chip can be utilized as a discovery platform for disease-specific drugs and biomarkers. In collaboration with two different industrial partners — Pfizer and Merck Research Laboratories — who also helped fund the project, together with support from the Defense Advanced Research Project Agency (DARPA), the researchers showed that two drugs targeting different key molecular components of inflammatory pathways can potently suppress pathological processes in asthma and COPD-tailored small airway chips. They also identified a macrophage-recruiting factor whose levels are raised by a viral mimic in the COPD model and which can be further investigated as a potential specific biomarker for viral exacerbations of COPD. “This novel ability to build small airway chips with cells from individual patients with diseases like COPD positions us and others now to investigate the effects of genetic variability, specific immune cell populations, pharmaceutical candidates and even pandemic viruses in an entirely new and more personalized way; one that will hopefully increase the likelihood of success of future therapeutics,” said Ingber. 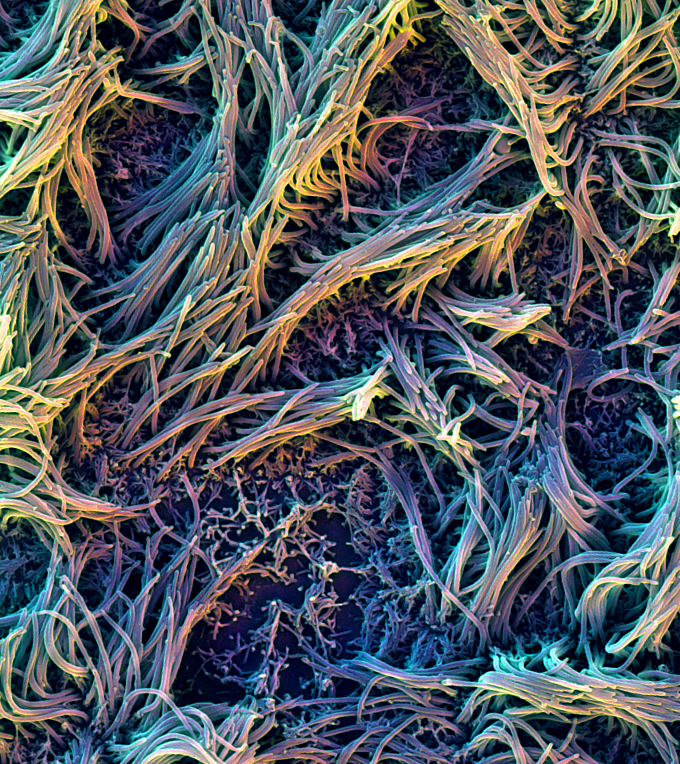 This scanning electron microscope image shows the air-exposed surface of the differentiated pulmonary epithelium with its beating, mucus-transporting cilial processes.